The author talks about roses. It was strange to return to Trinity Farm to participate in their new Rose Festival. The day dawned grey but was offset by a garden in full flower. Glorious roses in all their shapes, sizes and colours, tumbling over trees and fences or upright in their garden beds. It was a joy to be back especially without all that backbreaking work required to have the roses looking so proud. Karen and Grant Piercy organised the festival at peak flowering time for old fashioned roses. There was the opportunity to look, to buy either roses or sweet rosy treats and wander through the new barn where six stalls sold various works, from rosy crafts, jewellery (made from rose petals), books or rose chocolate. Seven years ago they purchased it from Lloyd and Ann Chapman who had started it from scratch over 25 years ago. Karen and Grant continue that early dream to tell the world about the beauty of old roses in a gracious setting where the roses are left to express themselves. 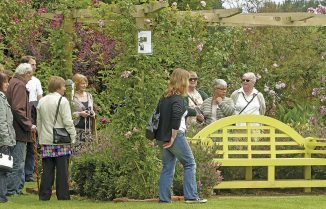 The festival was an opportunity to enjoy and learn about the undoubted charm of old roses. There were garden tours with experts, books tour by Ann Chapman who discussed the women and roses featured in her books and Touchwood Books who specialise in old and new gardening books and operate internationally from nearby Levin. Also on hand in the barn were ‘Flower memories’ – jewellery made from rose petal paste by Heather Chambers and Andrea Broadhurst. ‘Tussie Mussie’ had a large display of rose related items. There was also pottery by Kevin Haste and Joy Clifton and Sue Rushworth. Altogether something for everyone. Trinity specialises in heritage roses for sale either at the farm or on-line. It is a large three acre country garden featuring over 1000 heritage roses with a character barn where workshops are held on roses, arts and crafts. Energetically they also host a number of festivals and shows. There is the Easter heritage arts and crafts show, participation in the iconic Kapiti Arts Trail in November and this new event — the Rose Festival. The Garden is a 3 acre rambling country garden which features rose arbours, English style box hedges, walkways, a pond, colourful shrubs and perennials, a pottage garden which provide a great setting for the old homestead built in the 1890s. The roses are at their best November–December, but there is colour and interest year round. The garden is open to the public from Labour weekend until Easter each year but the shop is open all year round. Groups are welcome to visit by prior arrangement. The garden is also available for wedding ceremonies and photographs. Trinity Farm regularly holds workshops on roses, gardening, arts and crafts so you can learn the skills of yesteryear. The workshops are held in the barn. The barn is also available to hire. There is a website you can also browse or buy www.trinityfarm.co.nz.